Varanasi | A retired cobbler from northern India, Mahashta Murasi, claims he was born in January 1835, making him not only the oldest man on earth but the oldest to have ever lived, according to the Guinness World Records. According to Indian officials, the man was born at home in the city of Bangalore on January 6th, 1835, and is recorded to have lived in Varanasi since 1903. He worked as a cobbler in the city until 1957, when he retired at the already venerable age of 122. “I have been alive so long, that my great grand-children have been dead for years” explains Mr. Murasi. The man’s birth certificate and identity cards all seem to confirm his version, but unfortunately, no medical examination can confirm his saying for now. The last doctor Mister Murasi visited died in 1971, so there is little information available about his previous medical files. 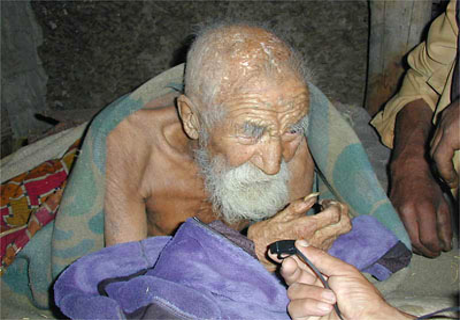 4 Comments on "Indian Man Claims He’s 179 Years Old"
Baba Sri Chand son of Guru Nanak Dev ji lived for 150 years also. Our rishi muni have availed live up to 500 hundred years. UniKat53, perhaps you missed John 7:24 in the Holy Scriptures? Also, if you want to talk about narrow minded bigotry, please look at yourself in the mirror first, okay? Thank you. Shut up, me, you know nothing.